Picture by SANDY McCOOK 10th April '18 David O'Connor, Chairman of the Glen Wyvis Distillery who has concerns over parking charges in Dingwall. 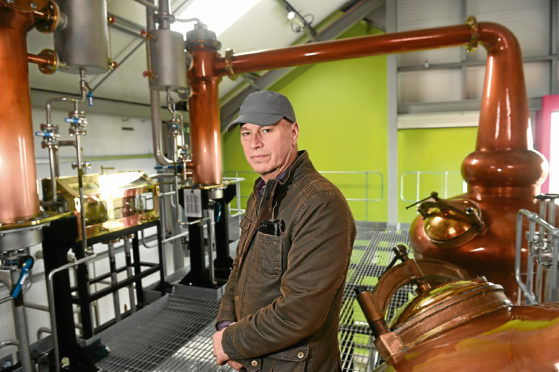 A new community-owned distillery has joined the campaign to fight parking charges in Dingwall. Managers at GlenWyvis fear charges will hurt the town and scotch their own plans for distillery tours. They had intended to run an electric bus to take tourists from the town centre to the distillery, providing the town with another attraction. Chairman David O’Connor called on the council to raise its game and think again. He said: “I worked in the public sector for 30 years so I understand the challenges of balancing budgets but I would say parking charges are a fairly soft target. “I think the council would have to seriously reconsider the matter in light of the public outcry, not just from retailers but the local community. Alister Mackinnon, the budget leader and local ward councillor, said: “Campaigners have to realise the state of the council finances – not just the Highland Council but all Scottish councils. If they think this budget is bad there is worse to come down the line. “One person told me after the game on Saturday we would have made a fortune then. Dingwall Community Council has also thrown its weight behind the anti-parking charges campaign and intends to call a public meeting ahead of the consultation period. A petition on the 38Degrees website and backed by the distillery has already garnered over 600 signatories. George Murray, who started the petition, believes it is essential for people to get involved to tackle the issue of parking charges. It also encourages people to email councillors in a bid to get Scottish Government consideration on the parking charges question.